Now that I have finally emerged out of my cookie coma, I can finally finish posting about all the Christmas goodies I made this year. This holiday season was a whirlwind of foodie extravaganzas. There were so many amazing meals, and delicious desserts, but most importantly I was able to get home to Minnesota and spend time (mostly cooking and eating) with my friends and family. I think they were just happy because I brought lots of cookies home with me. Ask any of my roommates from college how much I love Samoas Girl Scout Cookies (or caramel de-lites) and they will probably roll their eyes. I have been known to hide the purple boxes in my room so that no one will steal them. It's just that there aren't that many in the box, they trick you and use one of those vacuum formed plastic thingies (yes that is the technical term, and yes as an industrial designer I should know the actual term) to space them out, and plus, they only come around once a year. Not anymore. 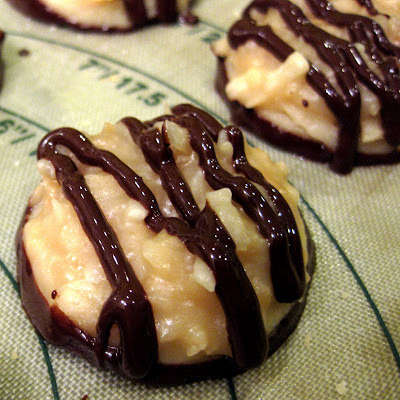 A great blog, Once Upon a Plate, posted a homemade version of these coveted cookies. I have had it bookmarked for a while now, and didn't think I was going to get to it this year, but after I screwed up a batch of caramels, (completely stuck to the pan after I neglected to line it with parchment paper) I figured it was a good excuse to make the 'samoas'. With a pan of homemade caramel and my hand mixer, I embarked on probably the most tedious kitchen endeavor I have ever taken on, and this is coming from the girl who has made homemade bagels and teeny tiny stuffed pastas in recent history. But oh man...are they good. They don't taste exactly like the real thing, and I will definitely be purchasing copious amounts of the originals when spring comes around and 'Girl Scout Cookie Season' kicks off. 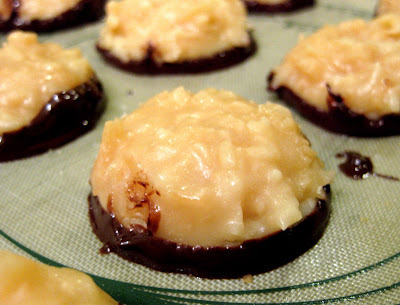 I think these are actually a different animal altogether with the dark chocolate and the homemade salted caramel. They are rich, VERY rich. This is a good thing for a person like me (a person with portion control issues) as it limits me to one cookie per sitting. Although, I have recently discovered that they are best straight out of the freezer, and that whole 'one per sitting' rule no longer applies. There are three main steps to this cookie, and you will see very quickly why this is a tedious process. 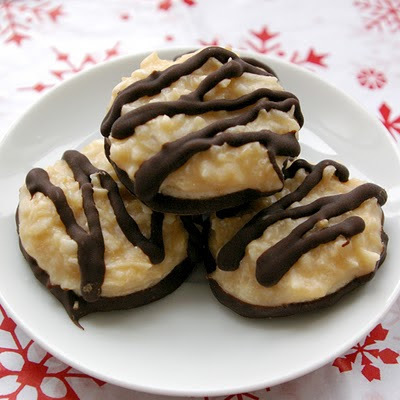 First you make the buttery cookies that are buried beneath the caramel coconut goodness. 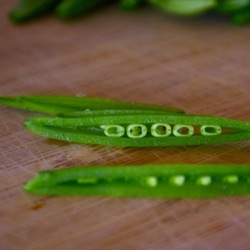 I made mine with holes in the center this time, but if I make these again, I will skip that step. I ended up filling the holes with the coconut mixture, and was too lazy to re-poke the centers out. As I see it, if there is no hole, that just means there is more cookie. 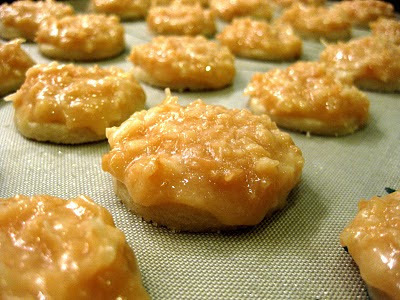 :-) Second step is to spread the coconuts caramel mixture on each one of these teeny cookies. Then comes the chocolate dipping/drizzling. The last part is probably the most difficult: waiting until they set before you pop them into your mouth. In a large bowl using a hand mixer (or a stand mixer), cream the butter and sugar together until light and fluffy. In a medium bowl, whisk together the flour, baking powder, and salt. 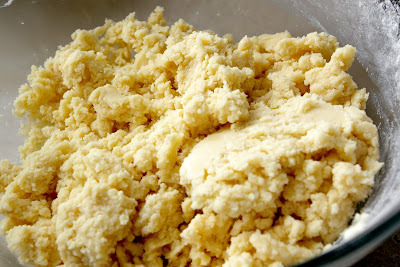 Add the flour mixture to the butter mixture in a few additions, beating on a low speed. Add the vanilla, and just enough milk to get the dough to come together, without being sticky (I only needed 1 tablespoon). Gather the dough together in a ball and divide into three equal parts. 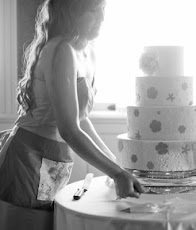 In between two sheets of parchment paper, roll one of the pieces of dough out with a rolling pin until it is 1/4 inch thick. 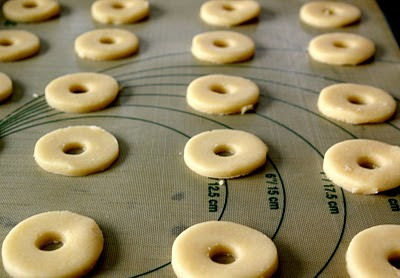 Using a 1.5" round cookie cutter, cut out circles and place them on a parchment or silicone lined baking sheet. If you want you can punch a hole out of the center of each round using the end of a large straw, or you can just skip this all together. Like I said above, if I make these again, I will not go through the trouble since it just got filled in with topping anyway. Repeat this process until you have used all the dough, and feel free to re-roll scraps once or twice. Bake cookies for 10-12 minutes until the cookies are just lightly brown around the edges. Let cool for a few minutes on the baking sheet, then transfer to a wire rack to allow to cool completely. Spread coconut evenly on a rimmed baking sheet. Toast for about 20 minutes, stirring every 5 minutes or so. Keep an eye on this in the last few minutes of toasting as the sugar in the coconut can scorch very quickly once it starts turning brown. Let cool on baking sheet. 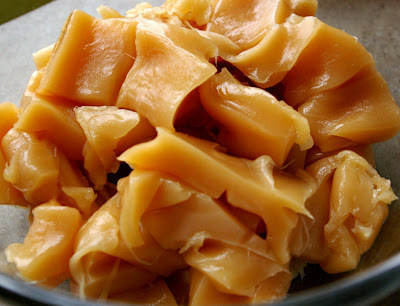 Unwrap the caramels and place in a microwave safe bowl. Add the milk and the salt, and microwave for 3-4 minutes, stopping a few times to stir the caramel. Once you get the caramel mixture to your desired consistency, spread about 2-3 teaspoons of the mixture on each cookie with a small spatula or offset spatula (I actually found my butter knife to work quite well) and place on a clean piece of parchment paper or silicone baking sheet. While you are doing this, if the mixture starts to firm up, pop the bowl in the microwave for a few seconds to re-melt the caramel. 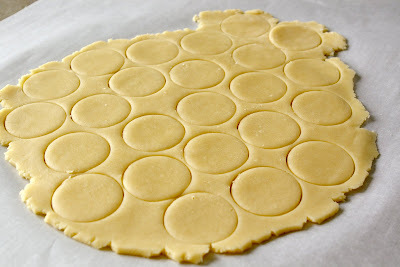 If you are getting fancy (or not being lazy) take a wide straw and re-poke the holes in the center of the cookies, again I skipped this step. More caramel = GOOD. Let cool and set up for about 10-15 minutes. Once the caramel topping has set a bit, place the chocolate in a small bowl and heat in the microwave at 30 second intervals, stirring thoroughly in between each interval until smooth. Be careful not to scorch the chocolate. You can also use the double-boiler method (which I did) by placing a small metal or glass bowl containing the chocolate over a small sauce pan with about an inch of simmering water, and stirring continuously until melted. This is where it becomes important that you let the caramel topping set and cool, it will help you keep a grip on the cookie while dipping. Take each cookie and dip the bottom 1/4 inch into the chocolate, and place back on the parchment paper or silicone sheet. After all the cookies have been dipped, pour the remaining chocolate into a small Ziploc bag (or pastry bag with a small tip) and cut off a very tiny portion of the corner of the bag. Pipe the chocolate over the top of each cookie, melting more chocolate if you run out. 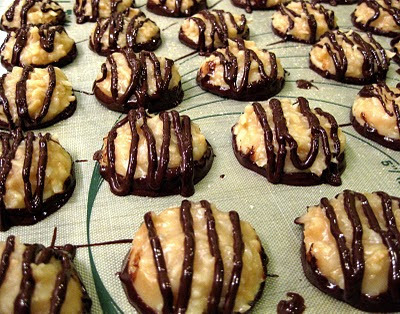 Now here is the tricky part: don't touch them until the chocolate has set...which takes forever when you are staring at about 48 Samoa cookies laying on your kitchen counter. Mine didn't turn out quite as pretty as the originals, but they were tasty. Hope your holidays were spectacular! Hi, Dropped in from Tastespotter, these cookies look great. I'm not much of a baker, but I am going to do what you did...bookmark this and make them sometime. Thank you for the great recipe and the lovely photograph. These are gorgeous! I am positively drooling. This is most definitely going into my bookmarks. Ah HA! My favorite of the girl scout cookies so I'm sure I would love these! Thanks for the great process photos. They look yummy! My girlish figure is doomed. I have to make these. Susan - I am not much of a baker either actually, I am just getting started with that whole "measuring" thing! but these are definitley a fun and worthwile challenge. Thanks everyone for the great comments! I think I have about 5 of these cookies left in the freezer, and have gone into rationing mode. It's a good thing girl scout cookie season is about here! :-) thanks everyone for stopping by my blog!